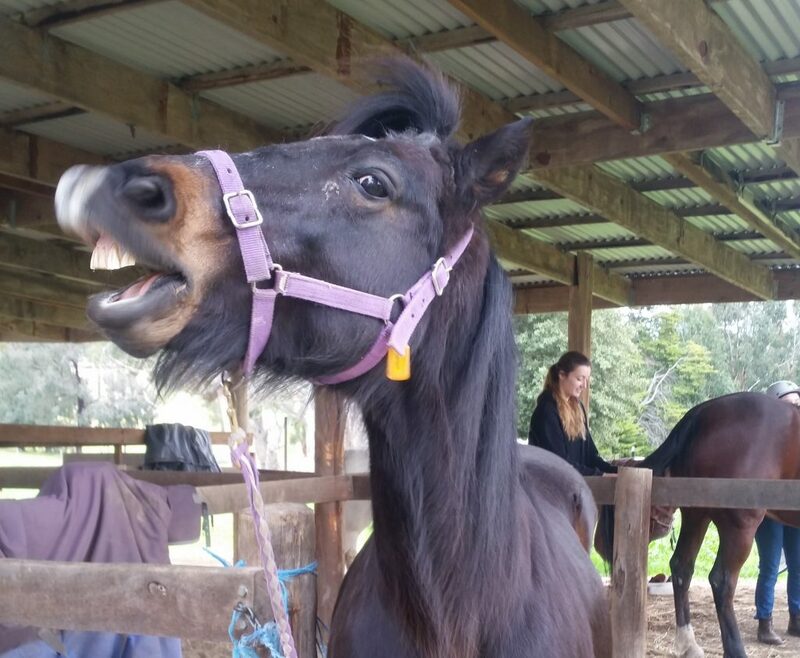 Did you know that you can estimate the age of a horse just by looking at its teeth?!? Or that on average, male horses have more teeth the mares (females)? Just like humans, horses get 2 sets of teeth over a life time, their deciduous teeth or you may know them as baby teeth, and there adult set. An adult horse loses its baby teeth over the first 3-5 years of its life and usually has a full set of permanent adult teeth by the age of five. An adult male can have up to 44 permanent teeth in his mouth at once, with mares usually contain between 36 and 40. Fun fact: a horse’s teeth take up more space in the head than their brain does! Horses are herbivores and continuous grazers. Grazing on hay or pasture for up to 18 hours a day. Horses are what are known as heterodontous. This means their mouths contain different types of teeth that are used for different purposes. Being a grazing animal more than half of their teeth are dedicated to chewing and grazing. These teeth are the premolars and molars, commonly called ‘cheek teeth’ and there are 6 of each on the top and bottom jaw of a horse. Twelve incisor teeth make up most of the rest. These are the teeth at the font of the mouth and are mainly used for biting off grass at the base and grabbing hay out of bales. Even though their main purpose is for eating it is not uncommon for a cheeky few to use these teeth as destructive weapons for ripping rugs off each other or leaving big bite marks on your nice stable doors. For a majority of mares (around 72%) the above mentioned teeth are all they have. But for males and a select few mares, their mouths also contain canines and wolf teeth. Wolf teeth are most commonly found on the upper jaw and tend to be removed due to issues they can cause. 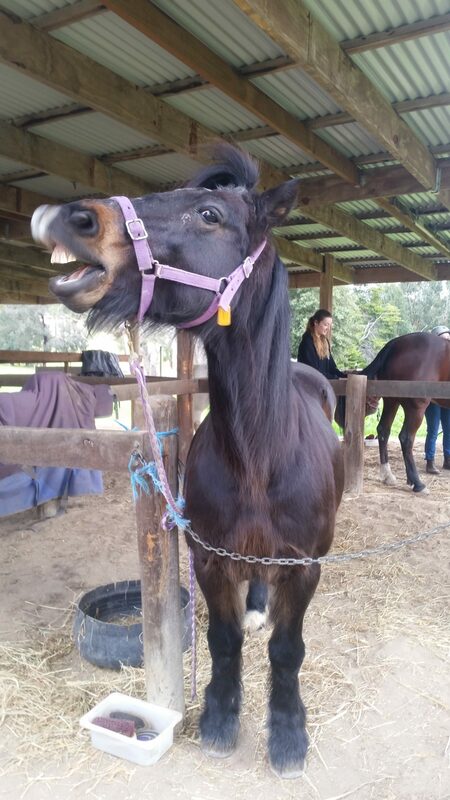 Horse’s adult teeth erupt through the gums in pairs, pushing out the baby teeth. 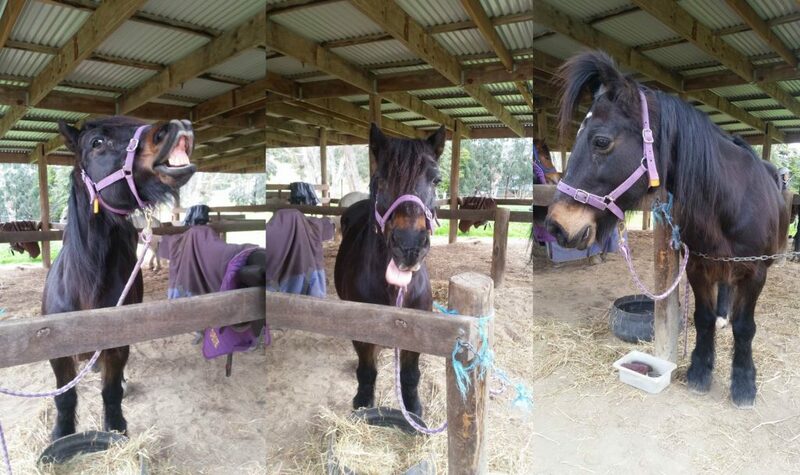 These adult teeth continuously grow over the life time of a horse as they are worn down by grazing. It is this continuous growth and the eruption can help us estimate a horse’s age. 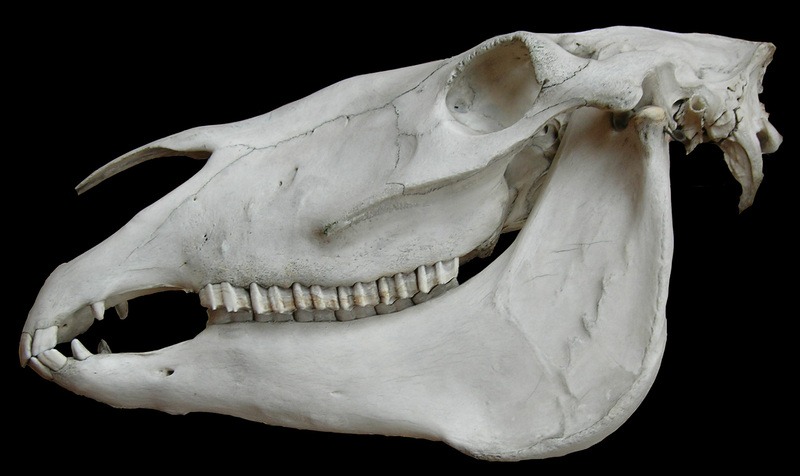 Fun fact: a young horse’s new adult teeth are around 80mm in length! As incisors grow a ‘Galvaynes Groove‘ becomes visible. This is a dark line that appears on one of the upper incisors. As the teeth grow the groove grows with it. It first appears in horse’s around 10 years of age and by age 15 the groove is usually around halfway down the tooth. Around age 20 the groove is starting to grow out, by 25 it should be half way down the tooth and by 30 it has all but disappeared. So if your Aunt Petunia has a paddock full of ponies, next time you visit impress her by taking a gander in their mouths and guessing their ages! Just like us human’s equine teeth also require annual dentist attention. One such dental procedure is known as floating. Floating is a means of filing down and smoothing a horses teeth with a tool called a rasp. The grazing action of teeth can cause uneven wear and also sometimes causes the outer edges of the molars to form sharp points. These sharp points can cause eating to be painful and result in sores, while uneven teeth mean food can’t be ground down enough for it to be digested efficiently. Teeth are vitally important to a horse’s heath, especially if the horse is ridden. Most people know that horses can be ridden in a mouthpiece called a ‘bit’. These ‘bits’ are placed in a horse’s mouth in the gap between the incisors and premolars. When used correctly bits should be painless. Bad teeth causing a horse pain, and therefore bits increasing the discomfort, can lead to a cranky horse and a bruised rider. While some horses may not need their teeth attended too every single year (as some horse’s teeth grow slower than others), an annual inspection of the overall health of the teeth and gums can keep 1) your pony’s pearly whites in tip top shape, and 2) you as the rider in the saddle and out of the dirt. Great post! I learned something interesting about a topic I know little about. Wondering what the issues wolf teeth cause? Also love your punny language! Everyone knows the saying “Don’t look a gift horse in the mouth”, but I’ve never actually known what it is that you’re looking for when you do have a squiz! Great work with the puns and clever subheadings! And they are some very fun photos of your beautiful pony! Thanks for letting me know! I swear it didn’t look like that when I checked after publishing. haha. I had to remove the photo as if i re-aligned it anywhere else it disappeared. haha. I love reading that, so interesting..
but there’s a problem with pics as they go messy and hide some parts of ur writing.